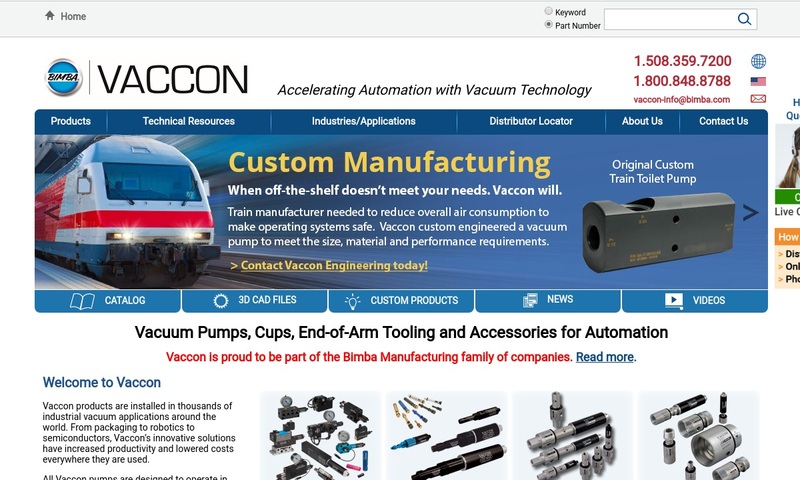 A reliable source for Vacuum Pump Manufacturers information and a resource for accessing leading Vacuum Pump Manufacturers and suppliers. A vacuum pump is a device that creates a partial vacuum or full vacuum by removing or eliminating gas from an enclosed, sealed space. Note that the vacuum pump is not the same thing as an air compressor, which increases gas by reducing its volume. A vacuum pump is necessary for a range of industrial settings and applications. These include: labs, surgical procedures, dental operations and a variety of manufacturing applications. Other applications include: ion implantation, dry etching, atomic layer deposition, electron microscopy, radiotherapy and radiosurgery. In labs, vacuum pumps help to control delicate testing environments when contaminants could destroy experiments. During surgical procedures or dental operations, medical vacuum pumps provide suction to improve cleanliness and visibility. In terms of manufacturing, vacuum pumps are essential for vacuum forming, creating eye lenses, producing light bulbs and carrying out many other complex assembly steps that would be almost impossible without vacuum technology. Vacuum Pumps A vacuum pump is a device that creates a partial vacuum or full vacuum by removing or eliminating gas from an enclosed, sealed space. Note that the vacuum pump is not the same thing as an air compressor, which increases gas by reducing its volume. 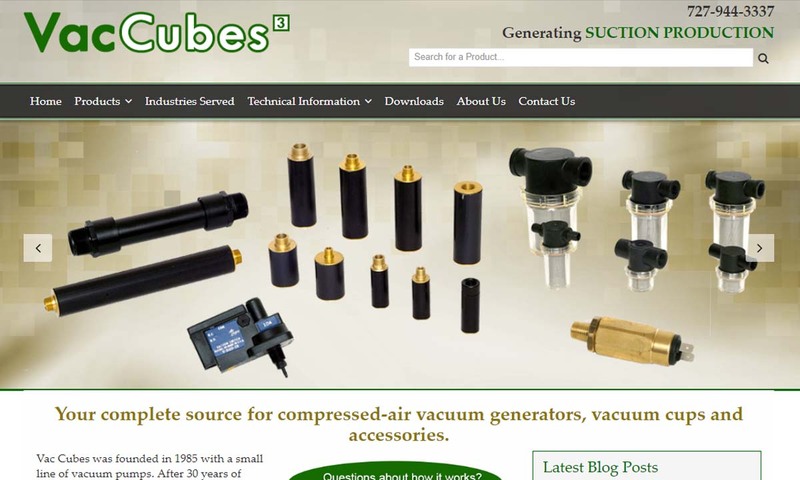 Here at Vac Cubes we manufacture high quality compressed-air vacuum generators, vacuum cups and accessories. We offer solutions for a full range of applications and industries. 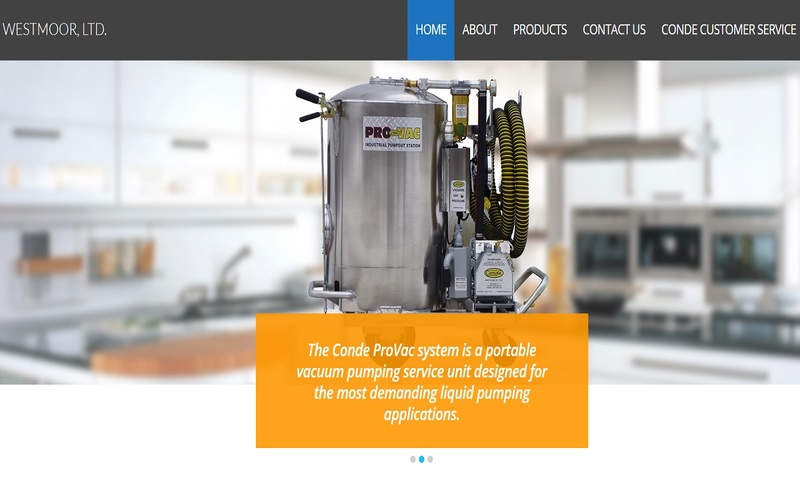 When it comes to vacuum pumps we are your premier source! With over forty years of innovation we are dedicated to provide our customers with products that will withstand the tests of time and provide a long lasting value. EBARA Technologies, founded in 1990, is a world-leading manufacturer of vacuum pumps and advanced pump technology products. 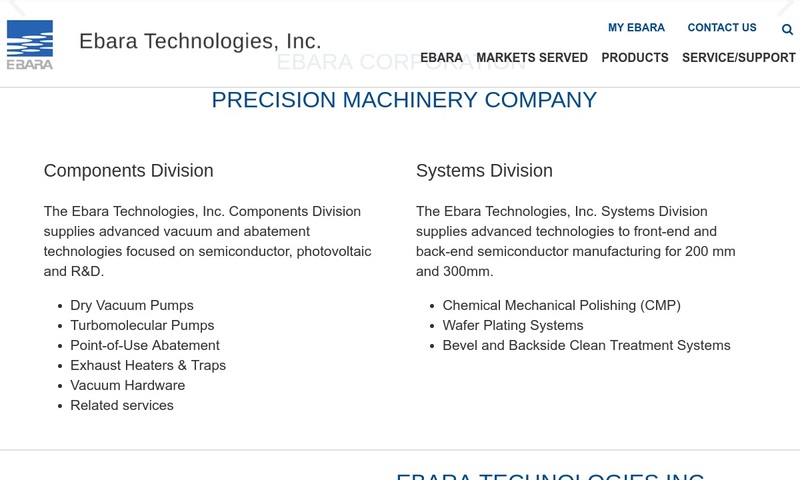 Innovators in dry vacuum pumps, turbomolecular pumps and abatement solutions, EBARA serves a broad clientele. We manufacture dairy and industrial vacuum pumps and compressors. Our Conde brand pumps feature dry vacuum pump units for the maple syrup industry, liquid waste pumps, and custom pumps. Today’s superior cutting edge vacuum pump products, offering reliability and high performance. Pfeiffer Vacuum is an intentional manufacturer and leading innovator of the Turbopump for high to ultra-high vacuum range. Vacuum pumps have been around for quite some time. Originally, they were created just for use in demonstrations and research. When this was the case, they were made from glass and were about the size of a large glass jar. To make it work, users would coat its edges with liquid sealant, then place it upside down on a surface with an outlet. Then, they’d remove air via an air pump attached to the surface outlet. 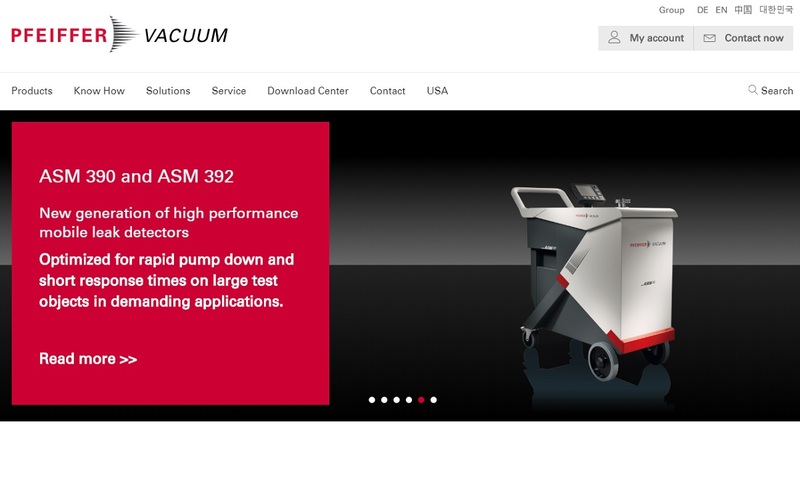 Vacuum Pumps – Vacuubrand, Inc. The first true vacuum pumps were invented in the 1650s by Prussian engineer and physicist, Otto Von Guericke. His first vacuum pump invention was the air pump (1650), which he used to create partial vacuums. It was known to achieve must lower pressure levels than those pumps that came before it. In 1654, he demonstrated efficacy of his vacuum pump during an experiment known today as the Magdeburg hemispheres experiment. During said experiment, he proved that not even two teams of horses could separate two hemispheres that he had joined together with a vacuum (evacuating the air). In the 1660s, Irish scientist Robert Boyle improved on Guericke’s model and used it to conduct experiments of vacuum properties. Then, British philosopher Robert Hooke helped Boyle develop an air pump that creates a vacuum. After this, the scientific and engineering community lost interest in vacuum pumps for quite some time. It was not until 1855 that they returned to it. In 1855, Heinrich Geissler invented the mercury displacement pump, quickly leading to the invention of the vacuum tube. In 1865, German chemist Hermann Sprengel invented a vacuum pump (the Sprengel pump) that uses mercury drops, which fall through a small-bore capillary tube, in order to trap air that will be evacuated from the system. Later, Nikola Tesla created a device that contained a Sprengel pump, designed to create a high degree of exhaustion. Vacuum pumps created during the 19th century were simple, low capacity fans that created small vacuums. Today, vacuum pumps, while based on these same models, are far more effective and efficient than their predecessors. Manufacturers usually make vacuum pumps from tough, corrosion resistant materials like stainless steel or titanium. To customize a vacuum pump system, manufacturers can do a lot of things, like using a unique number of pumps, or including chambers and seals, to create a higher or lower vacuum. The basic vacuum pump features one or more pumps, an inlet port and an outlet, or exhaust, port. In addition, some vacuum systems feature metal chambers with metal gasket seals. These are used to achieve a higher vacuum. Regardless of their individual features, all vacuum pumps work by sending air out of an enclosure, then preventing it from coming back in. To help the system run smoothly, many also feature vacuum pump oil. There are several types of vacuum pump systems. Essentially, every vacuum pump is an air pump because it moves air out of an enclosed space while also preventing it from re-entering that space. There are three primary ways of directing airflow in a vacuum pump: positive displacement, momentum displacement, and entrapment. These three make up the most common types of pumps. Positive displacement pumps continuously open and exhaust a closed cavity in the system. Rotary vane pumps, scroll pumps, piston pumps, diaphragm pumps and liquid ring vacuum pumps can all be considered different types of positive displacement pumps. The positive displacement method is used in low-intensity vacuums. Momentum transfer pumps remove the air from a sealed pump by propelling the air molecules through high-speed fans or gas jets. Examples of this technology include diffusion pumps and turbomolecular pumps. The momentum transfer principle is used to create low-pressure vacuums. Entrapment pumps trap gases. They do this by heating or cooling the gases so that they become much easier to catch. There are two main types of entrapment pumps: cryo and ion. Cryo pumps use cold temperature surfaces called “arrays” to trap and freeze gases in a solid state. Ion pumps react with gases inside the pump chamber, then bury those gases in their wall. With ion pumps, customers can achieve ultra-high vacuum levels. In addition, all vacuum pump systems are either wet or dry. A wet vacuum system is any vacuum system that makes use of liquid at any point in the process. Wet vacuum pumps are able to achieve a lower vacuum pressure. The only downside is that wet vacuum pumps require much more maintenance and their failure could be very costly to industrial operations. Wet vacuum systems may also use oil or lubricant as a sealant in order to create air-tight compression. If they use liquid within their mechanical enclosures to create airtight seals, they are known as liquid seal vacuums. If they use oil to provide the seals, they are known as oil-sealed vacuums. Oil-sealed vacuums are best in high-intensity situations because oil is an excellent seal between moving parts. Dry systems are the opposite of wet systems; at no point do they use any liquid. Dry vacuum pumps eliminate the need for added oil, but they tend to be less effective in collecting contaminants and other particles. However, they do typically require less maintenance and are less likely to fail during critical applications. That’s why they are optimal in a completely different set of applications, such as aircraft instrumentation. Finally, there are other vacuum pumps that feature the characteristics of more than one main pump type, or are unique to themselves. Rotary vane pumps are a type of oil sealed vacuum. These air-cooled, direct-drive pumps are used to pump dry, clean non-reactive gases. They are valued for their small carbon footprint and reliability. Screw air compressors, also known as rotary-screw compressors, are gas compressors that work using positive displacement. Types include: piston vacuum pumps, diaphragm pumps and liquid ring vacuum pumps. Piston vacuum pumps, or rotary piston vacuum pumps, are industrial vacuum pumps. They consist of rotating, varied-length pistons that pump fluids through check valves. Diaphragm pumps pulsate to displace fluid, as check valves control the direction of fluid flow. Liquid ring pumps are used to evacuate dry and wet gases, as well as condensable vapors and small liquid particles suspended in incoming gas. There are a variety of specialized vacuum pump types, used for specific purposes. Examples include laboratory vacuum pumps, medical vacuum pumps, high vacuum pumps and automotive vacuum pumps. Vacuum pumps are advantageous first for their efficiency. Not only do they make the systems in which they are installed run more smoothly, but they also allow for better and more efficient atmospheric pressure control. Next, vacuum pumps evacuate gas better than any other apparatus or technique, including suction. Finally, vacuum pumps are durable and reliable. Typical vacuum pump accessories include: compressor kits, vacuum gauge components, extra safety valves, vacuum bag sets, vacuum hoses and power cord assemblies. Proper care for your vacuum pump starts with familiarizing yourself with the issues commonly associated with your type of vacuum pump. Equipped with this knowledge, you will be better able to notice and remedy any potential problems early. This is a part of regular vacuum checkups, which you should perform per the recommendations of your supplier. In addition, if your system relies on lubricating oil, you need to make sure that it is never running low and that it never becomes contaminated. The standards to which your vacuum pump system must adhere depend on your industry, application and location.  If you are located in the United States, we recommend you get, at the very least, OSHA and ISO certification. These will ensure that your system is both safe for your workers and effective in general. To learn about what standards your vacuum pump should meet, talk to your industry leaders and/or relevant governmental offices. 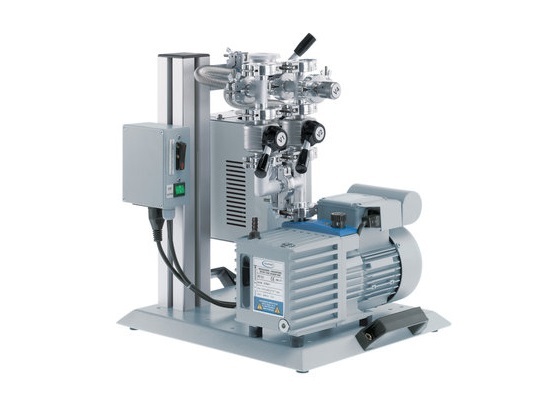 When you go to purchase a vacuum pump, it’s important that you know all the details of your application, so that your manufacturer knows best how to help you. Consider writing these down, so that when you speak to a potential supplier, you can readily relay your specifications. Don’t forget to write down your budget, your timeline, your delivery preferences and your standard requirements. When you have put together your list of specifications, you’re ready to begin your search for the right manufacturer. To help you in this endeavor, we’ve compiled a set of vacuum pump companies that are experienced and reliable. You’ll find their individual profiles interspersed throughout this page. Take some time to study each of these profiles, with your specifications in mind. Pick out three or four manufacturers you believe best meet your requirements. Then, reach out to each of them to discuss those requirements. When you’ve done that, compare and contrast your conversations, and choose the manufacturer that will work best for you. Remember that you want the manufacturer that offers the products, services and customer service that most closely aligns with your needs. Good luck!